Color guides the way to inspiration. I’ve always been drawn to the colors of the ocean, navy blue, sea-foam green or turquoise. 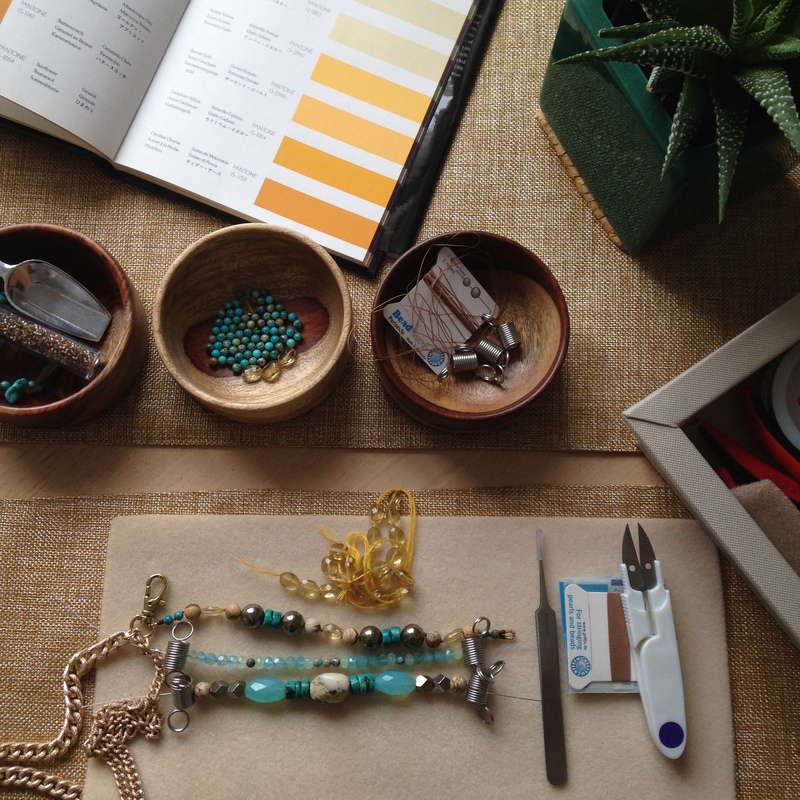 Inspiration in selecting beads can come from anywhere, fashion, textile design, a flower or a polished druzy agate. When I hand-pick my beads for color, pattern design, transparency, natural organic forms or hand-cut shapes, the light reflection quality is what make my heart beat the fastest! What’s your favorite color this season? Interested in more juicy details and my jewelry design? Cool! Click here to go to the Jewelry Page. Wooden Boats, Not Just For Vikings. Artists & photographers who love romantic boating scenes inspire me. Catching the light in a photo or in a painting. Saving a moment in time. I captured a lot of moments on my IPhone this past summer on the Great Lakes with my family. It was a bit hazy that afternoon in August. I uploaded this stunning wooden boat picture to my Instagram page and used a filter to enhance the colors. He just needs a wooden boat for the next photo shoot. 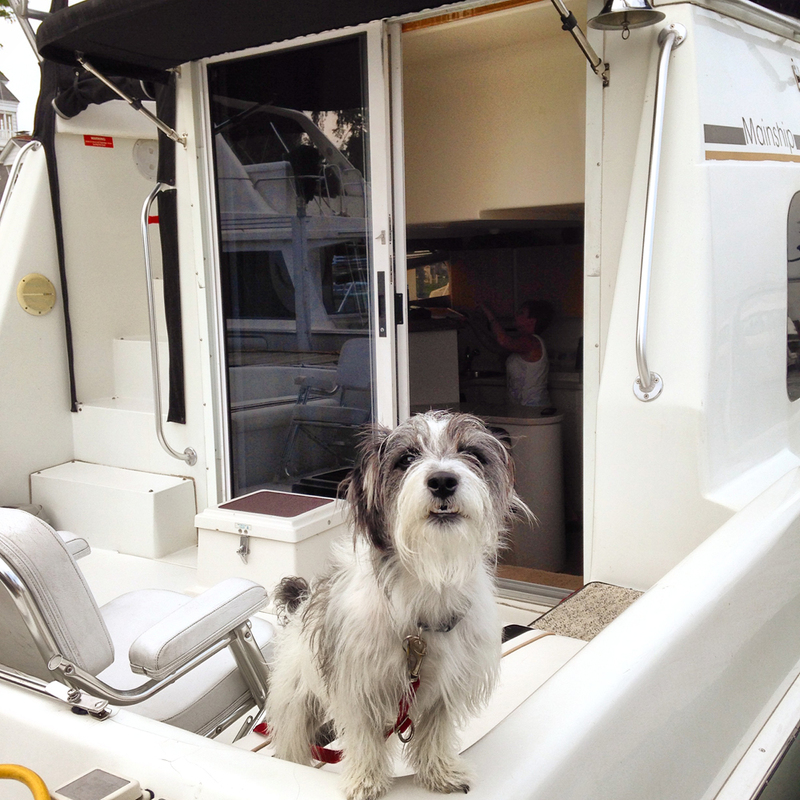 Most dog lovers have at least two dogs on board. This guy was alone and wanted attention. 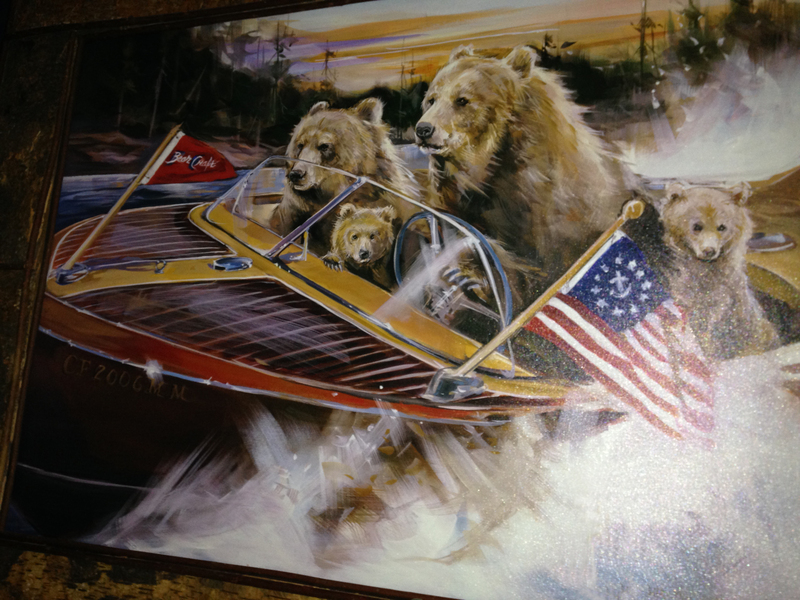 I love this painting of a bears flying by as they ride in wooden boat. Suzanne Inspired me to create this post about wooden boats. 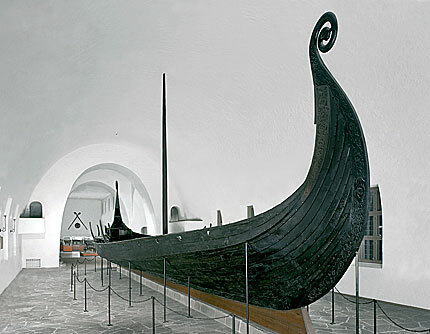 She has a stunning website and blog and this is her post about a Viking Long Ship. I read a post yesterday by cartoonist, illustrator, and writer Summer Pierre, titled, “On Value and Being Seen.” She was asked to share her thoughts on how she could skate the inevitable line of doing work for work sake, and doing work to be seen. Thank you for sharing! This writing makes me put some ideas into perspective about creating my own work and what is relevant, or going for a trend that has a huge audience. To be valued or to be seen. As I wrote this post, I found this subject to be a lot more complicated than I first thought, so there could be more to come. Thanks in advance for reading and please chime in! Don’t be afraid to rock the boat! I am a jewelry designer and a graphic artist. Evoking emotion is my goal whether I’m working for a client or doing art for bliss. When I put together ideas for a design, I do consider my audience, and hope they value my hand-picked pearls and gemstones. As a graphic designer, I strive for what is relevant and hope they value my unique style. (or on some level, have artistic intelligence about concepts like, white space, font choice and composition.) All right now! Yes, when I have more artistic freedom to create what inspires me, and experiment on my own schedule — bringing beautiful materials to life in unexpected ways is very gratifying — as is having others notice my designs. Having something to say and the passion to create from an idea in a meaningful way is so cool. I think passion is the key word for me. Having my relevant work be valued by relevant people is somewhat up to me by getting myself out there by navigating through unknown waters, learning from others, and sharing ideas. My social media accounts like Instagram and Pinterest are a blast and have value too because I have a few artsy friends and we help promote each another. However, sometimes attention is great but can be fleeting. So, to be noticed by buyers and to be respected by my peers takes time and dedication, while remaining consistent in my craft. Creating what is relevant is always a goal, but who decides what is relevant in the marketplace? To be valued or to be seen? Can we have both? I have a lot of work to do, but that is why I’m here! This is a great subject. I plan on learning more about what other artists think and do. The original comment I left can be found here. Every day we go about our business with one day leading into another like a continuous movement of waves on the ocean. Some waves are big, and some are really big and frightening. Then suddenly, I wake up from that horrible dream of a tsunami and feel so blessed to be alive! On a really good day on the water, a sailor needs some wind to arrive at his destination. So where am I going with this? Sometimes it’s the simplest things in life that make us happy, like watching the sun set on the shoreline, or the fisherman cast his line, and the turtles poke their little heads above the water. I guess it’s the scary things I experienced that helped me to grow and learn to appreciate the little things. Yes Dad, I did pray to God, to please get us home safe that windy day on Lake Michigan in Little Traverse Bay. I was so scared. Seven foot waves coming from more than one direction — slapping the 46′ Maxum with sheets of water that sprayed over us — was a day you hoped you’d already made “peace with your maker”. I was not proud of myself, when I got sick in Ron’s green cooler with that lonely can of beer in it. That boat ride to Lake Charlevoix was the longest trip ever! So, what I forgot to say is, growing up on the lake was a blessing, and I’m glad you were at the helm that day when the weather was worse than they had reported. I remember you said, “that’s just a part of boating, I hope we didn’t scare you away.” Even though I trust your judgement and your 30-plus years of experience on the big waters, I’m still a little afraid. Maybe that’s part of what makes it exciting, like the tsunami dream when I suddenly wake up and feel happy to be alive! Thank you for all the years of amazing adventures on the Great Lakes, and for being my Dad. This video is from July 4, 2014, one of my treasured memories. This is where I need to be right now, no looking back and no regrets. Only beautiful thoughts, blessings, images, and words will be my space to create in. Creating my way to the pursuit of happiness! I am a jewelry designer and graphic artist. 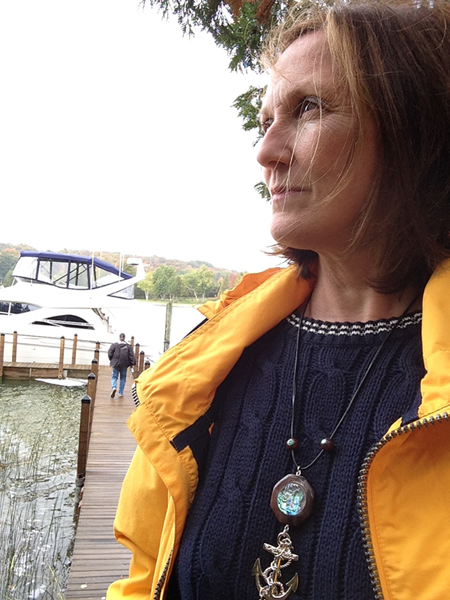 On this blog, I hope to explore and learn, make new friends, share my ideas, present my jewelry designs, write about my process, post photography of my boating rendezvous on the Great Lakes, and share artsy tips! If I can do all of this, and cook for my husband, then wow, what an accomplishment! 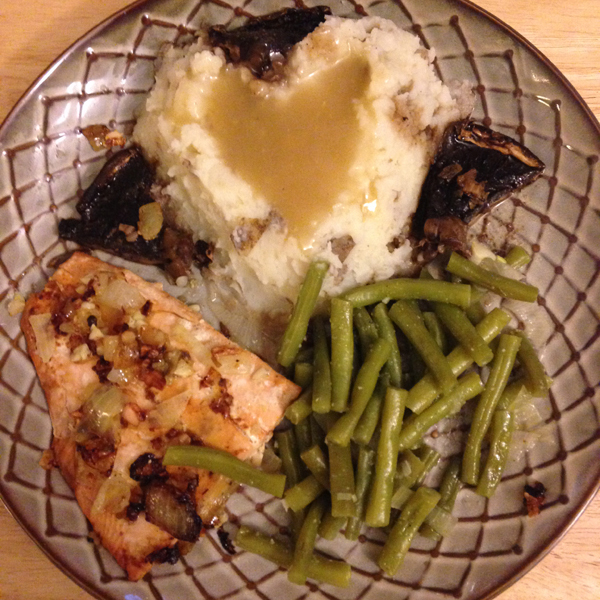 (He’s a much better cook than me and made the heart mash potatoes) I’ll have to allow myself to make mistakes along the way, in this new creative journey, in the pursuit of happiness.